As the trusted pioneers of inflatable tent technology, with over 17 years’ experience, Vango continue to innovate and deliver exceptional tents design and this year is no different. Our family tent collection has never been so comfortable with innovative technology and features to add to your experience. Whether you’re looking for the perfect tent for a short weekend trip with friends or for summer adventures with the family, our collection of AirBeam® tents will be sure to meet your camping needs and turn heads on the campsite, wherever you go. Fabric innovation has been a key development area for the Vango team in 2019. Our research and development have resulted in the introduction of five new fabrics which will beat the elements come rain or shine. When pack size and weight are the key influencers in choosing your tent, our specifically designed Sentinel Active fabric will surpass your needs. 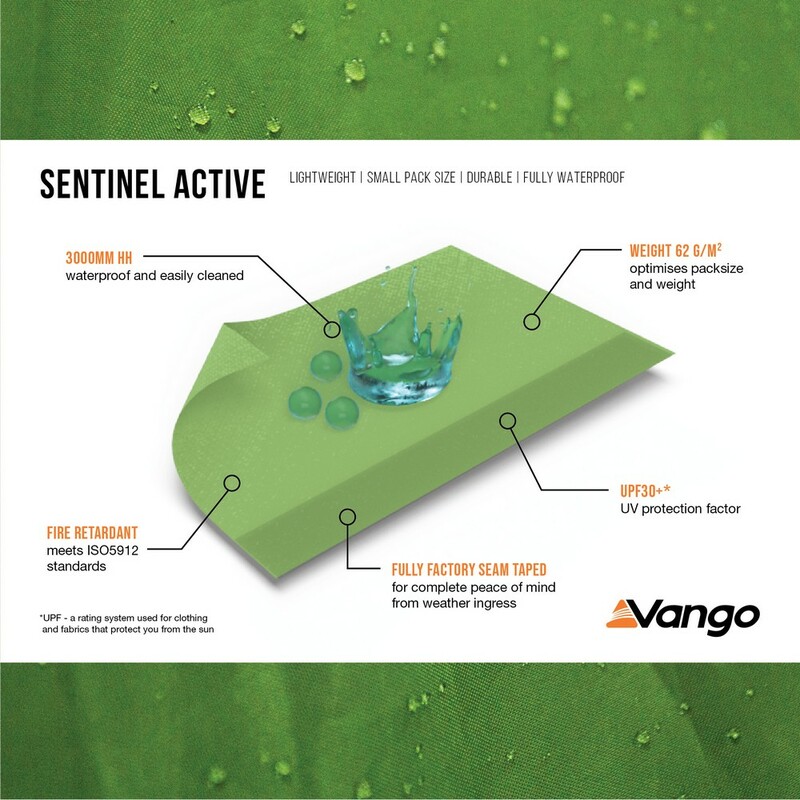 Sentinel Active is strong, whilst being waterproof to a 3,000mm HH rating, ensuring great quality and performance couple with compact pack sizes. Our new Sentinel Dura has been developed to create a fabric with improved performance without the addition of unnecessary weight. 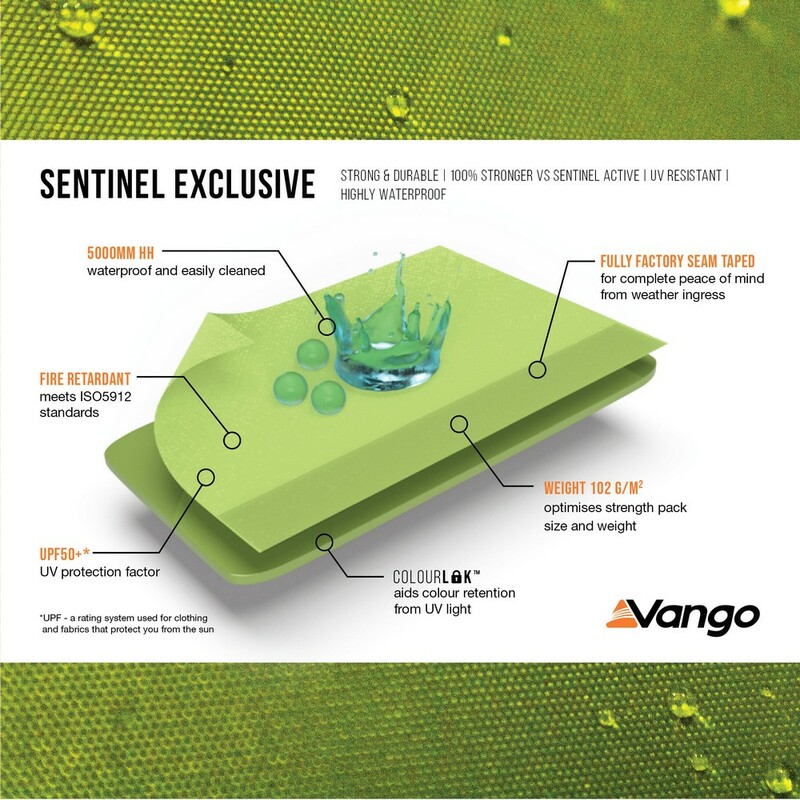 The introduction of our new ColourLok technology (improving the UV performance of flysheet fabrics) and a 30% increase in strength compared with our Sentinel Active fabric, coupled with a 4,000mm HH waterproof rating, guarantees market leading quality and performance. This fabric is a staple feature of our AirBeam Excel collection as well as our poled Exceed collection. Featuring in our AirBeam Exclusive tent collection the newly developed Sentinel Exclusive fabric is one of the strongest and most durable fabrics in our collection. Testing at more than double the strength of standard flysheet fabrics, highly waterproof with a 5,000mm HH rating, and with our new ColourLok technology improving the UV performance of flysheet fabrics the performance is second to none. Also featuring as a fabric in our AirBeam Exclusive tent collection is Sentinel Signature. Sentinel Signature combines the leading properties of both cotton and polyester to create a feature rich polycotton fabric. Key amongst these are breathability to increase comfort and its easy upkeep. The softness of the cotton and the dense weave ensure that light and noise are reduced. Sentinel Signature is a high-quality fabric that is luxurious to touch but robust and durable enough for any holiday. 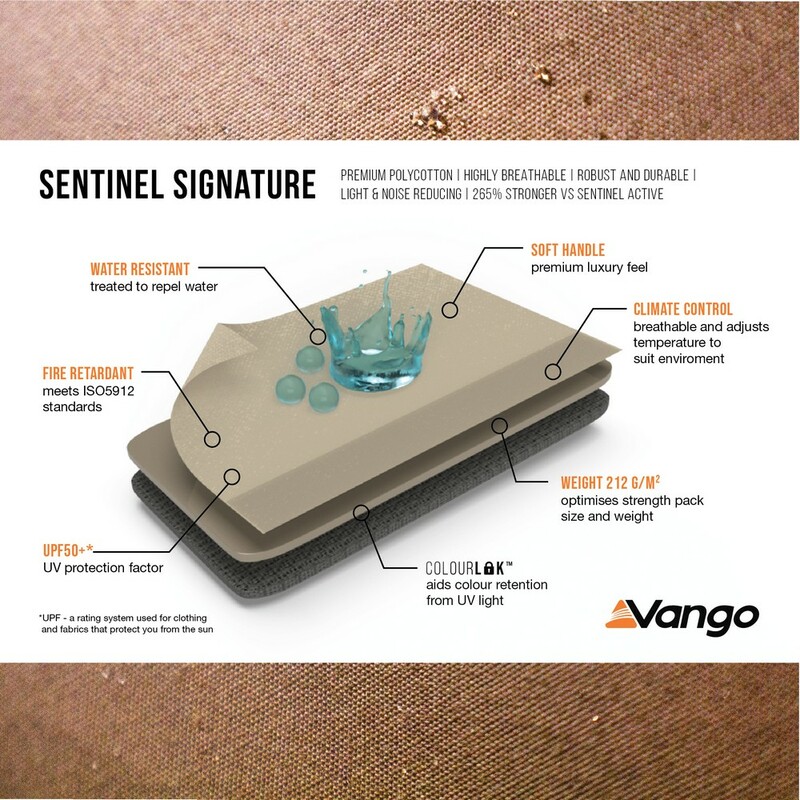 Vango Sentinel Pro fabric is designed for dedicated campers who embark on several trips a year, often for extended breaks. The blend of fibres and double ripstop construction is 245% stronger than our entry level Sentinel Active fabric, ensuring longevity against any wear and tear. Our new ColourLok technology enhances resistance to UV fading. 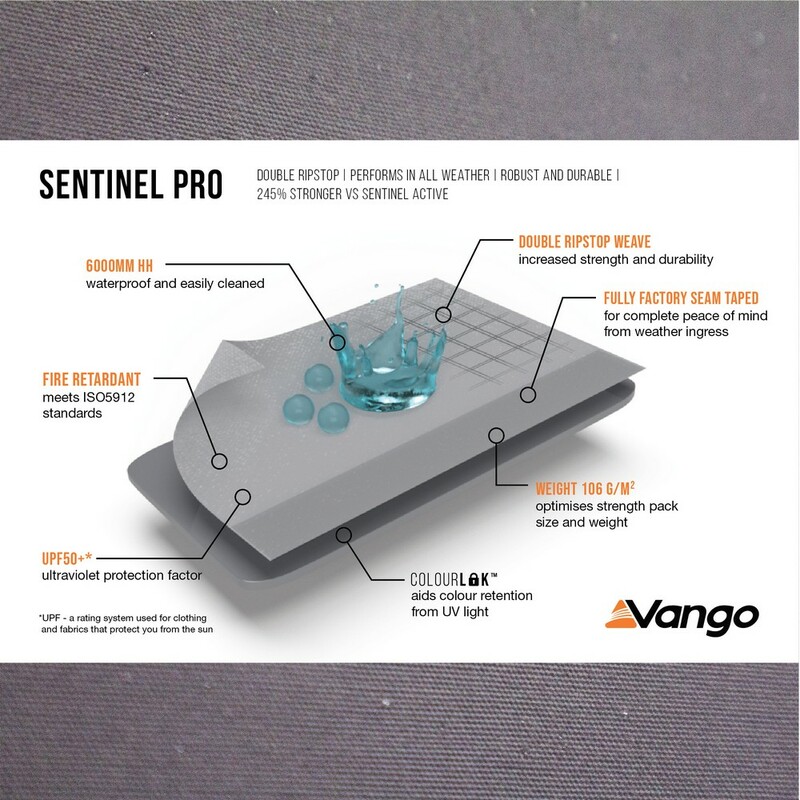 Sentinel pro is extremely waterproof (6,000mm HH rating) and will perform in all weather conditions. With such high preforming properties, Sentinel Pro features in our top of the range collection AirBeam Elite. Following the success of our Experience Range in 2018, we’re excited to introduce, for 2019, an AirBeam® Experience range. Designed to introduce families with a love of the outdoors to the wonders and ease of camping, you’ll be pitched in no time, so you can take full advantage and explore the outdoors! Popular models from the 2018 poled collection, such as Winslow and Longleat have been carried over into this collection, and two brand new and feature-packed tents have been introduced! 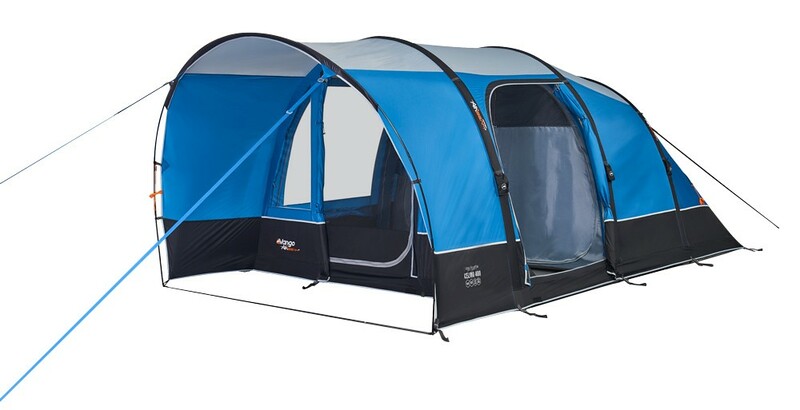 Offering a great balance between living space and must-have features, the Stargrove Air 600XL is perfect for families looking for a tent which is practical yet great value for money. The Stargrove has masses of room which includes 3 bedrooms that sleep up to 6 people, a large double section living area and pre-attached front awning. The compact Skye Air 500 is the smallest AirBeam® tent in our collection but, that doesn’t mean it isn’t mighty! Designed using our NEW Sentinel Active fabric and including great features such as a linked-in groundsheet for easy cleaning, inner tent pockets for storage and lantern loops. The Skye 500 AirBeam® tent is perfect for campers who need a tent that is small in pack size and keeps up with demands of their outdoor pursuits. Skye Air 400 also available. Not wanting to disappoint, we didn’t stop there. 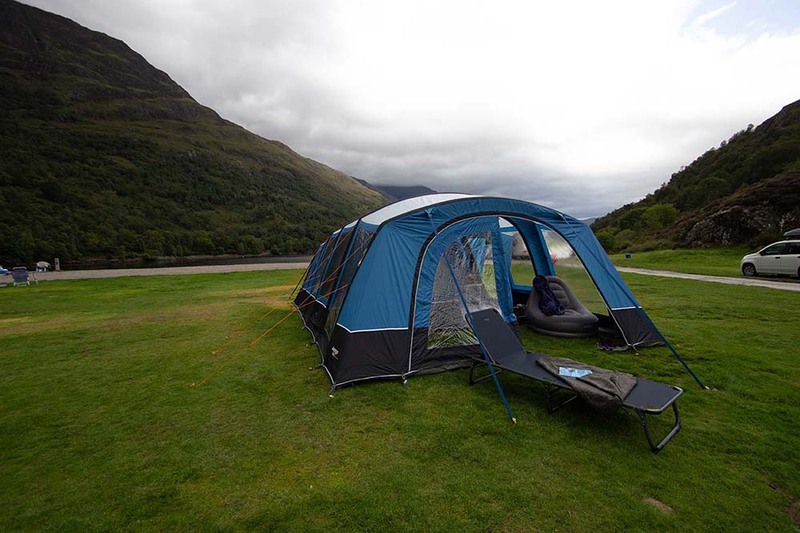 We have also introduced 6 new tents across the other three collections within our AirBeam range. These include brand new features such as Clear Access Bedrooms for easy access, reducing trip hazards; Villa Construction which offers more vertical walls, giving more usable internal space; AirZone Panel to increase ventilation within the living area for an all round better atmosphere and much, much more. Read on to find out more about each of the new 2019 tents. Featuring full stand up height Emperor bedrooms, you are not only guaranteed a great sleep but the storage space at the back means you can keep everything clutter free, yet easily accessible. The Valencia also features our new Clear Access Bedrooms allowing you to easily move around the tent. 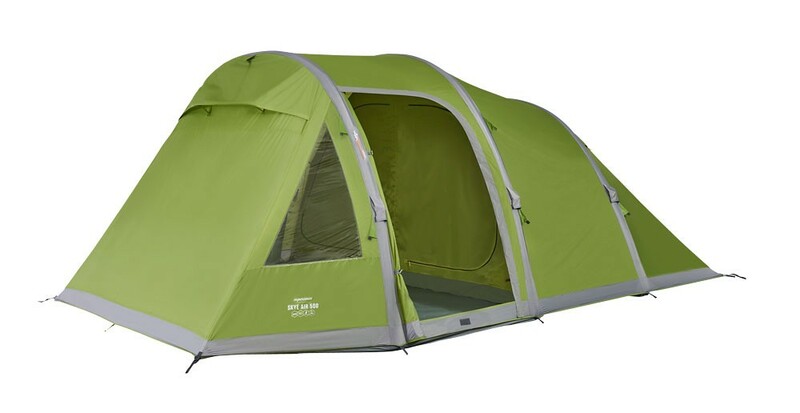 The Tahiti 800XL tent is completely unique to the Vango AirBeam® collection. Featuring a very spacious living area, Super King bedrooms and a pre-attached conservatory, the Tahiti isn’t short on space. A great asset to the Tahiti 800XL is the Side Studio which can be used as an extra bedroom or storage space. The large front windows allow you to enjoy the views within the peaceful conservatory. Tahiti Air 600XL also available. 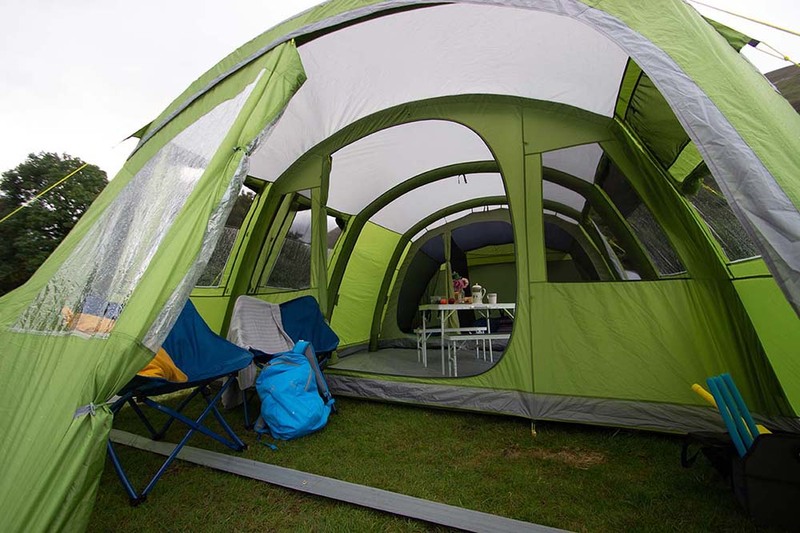 The Celino 400 AirBeam® tent has been designed using a simple yet effective layout, popular with smaller families and couples. 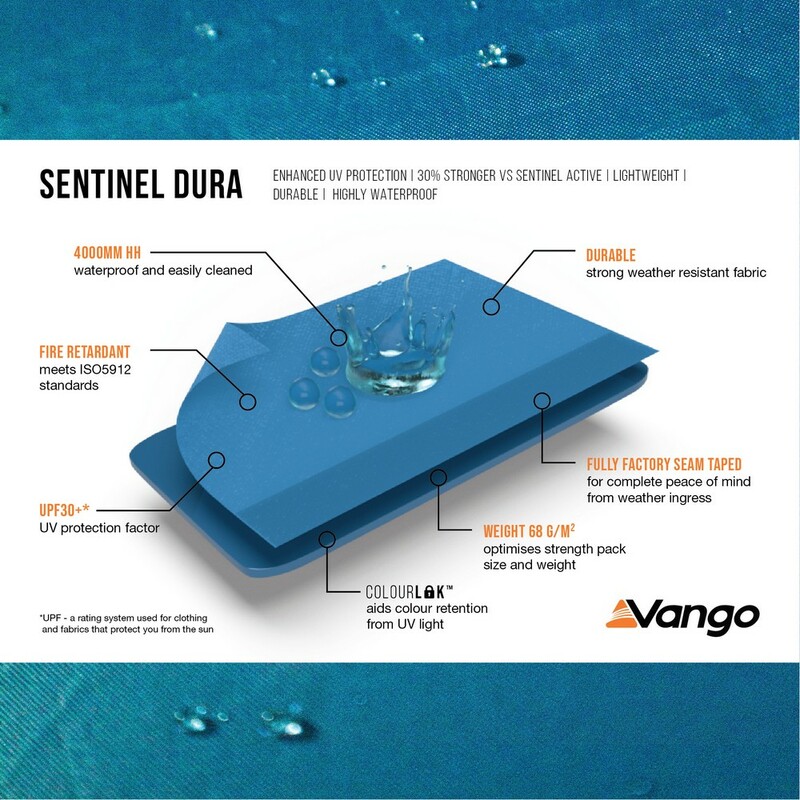 The Celino features our new Sentinel Dura flysheet fabric (4,000mmHH) ensuring performance no matter the weather. Vango AirZone® allows you to regulate temperature and SkyTrack™ II hanging system (compatible with our SkyStorage™ and SunBeam lights) means you can truly tailor the space to your needs. Celino Air 500 also available. The Utopia has a great balance of space thanks to the Queen-size bedrooms and generous living area. The covered front door creates a shaded porch area protecting you from the elements no matter the weather. The Utopia also features Storm Anchors for greater stability in high winds and our unique SkyTrack II hanging system. 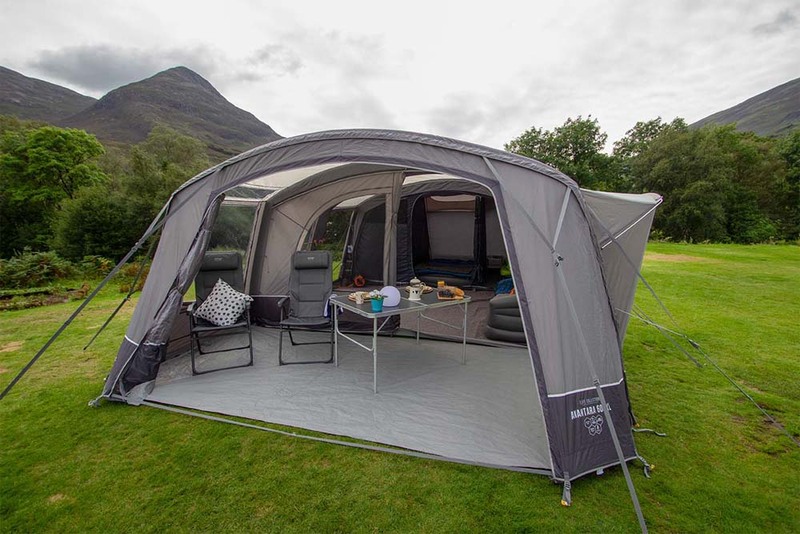 The sophisticated Azura 600XL has been designed with near upright vertical walls allowing you to truly maximise the height and floorspace within your tent. 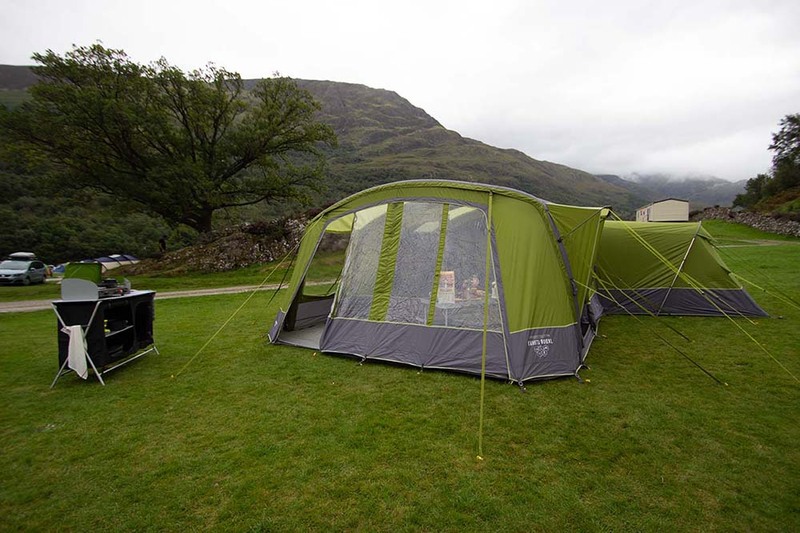 The Azura also benefits from Vango AirZone® which helps to regulate temperature, Lights-out Bedrooms ensuring a great night sleep and large Diamond Clear windows, so you can enjoy the views outside. The Anantara 600XL is evidence of our desire to ensure our tents are comfortable and functional. Utilising a near upright wall structure providing greater internal living space, combined with a vast conservatory front with additional porch door there is ample space for all your camping essentials. You are also guaranteed a comfortable night's sleep in the Anantara in the Deep Sleep, Super King Bedrooms giving you enough space for a bed and storage. Anantara Air TC 600XL also available. 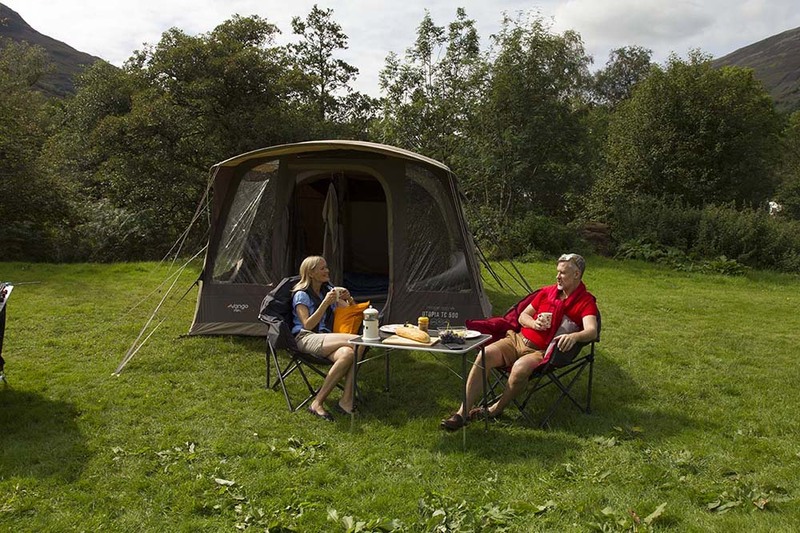 View the full range of AirBeam tents.